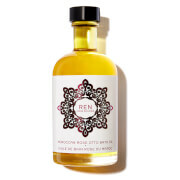 Lift tired spirits with the clarifying and focusing De-Stress Mind Bath & Shower Oil. This bath oil helps relieve stress and anxiety while refreshing mind and body with the calming blend of Frankincense, Petitgrain, Wild Chamomile and Rosemary essential oils. Cocos Nucifera (Coconut) Oil, Citrus Aurantium Amara (Bitter Orange) Leaf/Twig Oil, Rosmarinus Officinalis (Rosemary) Leaf Oil, Ormenis Multicaulis (Wild Camomile) Oil, Parfum**, Boswellia Carterii (Frankincense) Oil Benzyl Benzoate*, Geraniol*, Linalool*, Limonene*. *Natural Essential Oil Contents, **Natural Plant Extracts. Pour a capful into a warm bath or massage a capful onto your torso, lower back and chest before showering. This bottle will provide you with 20 bath or shower experiences for you to strengthen your mind and body.